Now that Autumn is well and truly upon us, it’s time to rejuvenate your favourite beauty products with tips on what you could afford for this term if beauty is your bag. 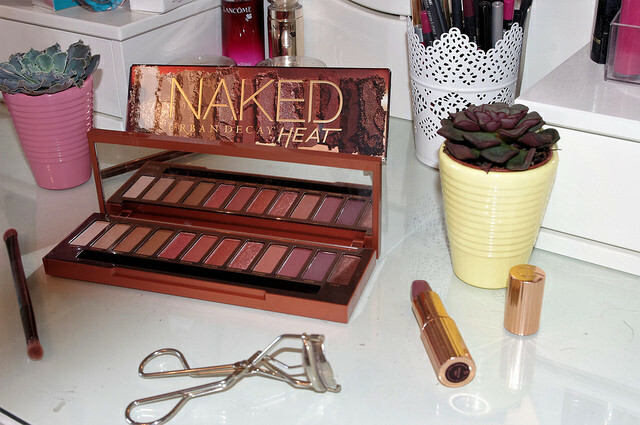 I’m going to begin with this: the concept behind the naming of Urban Decay’s latest palette, Naked Heat, confuses me. As much as I understand the link between reds and heat, and the play on passion within the name, this palette is far too autumnal to be associated with heat in my opinion. However, after waiting months and months to get my hands on it, I finally took the plunge and treated myself; doing my best to ignore the name. All of Naked Heat’s colours in this palette are to die for, and that’s really not an exaggeration. In comparison to the other Naked palettes, I believe Urban Decay have finally mastered the formula for perfect pigmentation. The Autumn season is strongly reflected, and the different colours remind me of the leaves covering the ground after they’ve fallen off the trees. Despite how striking each shade is, you can combine a variety of them for a soft, Pumpkin-spice-coloured look. It’s not only a key palette for Autumn, but one for creating sumptuous Halloween makeup, as well as the inevitable first term party rush. So, if you’re looking for an addition to your beauty haul, and haven’t yet got your hands on Naked Heat, dive into the pile of fallen leaves – you won’t regret it. Alternatively, if you’d prefer to save some of your student loan to pay for essentials (just in case you run out of food by the end of Michaelmas – we’ve all been there), then look no further than Sleek. Sleek are already a well established brand for affordable beauty ‘dupes’. Their highlighters in particular are lust-worthy, but their i-D eyeshadow palettes are something else. They do particularly good alternatives of Naked palettes too. Now, this particular palette isn’t anywhere near a replica of Heat, but the golds and the other neutral tones mirror its warmth. It’s called All Night Long and combines neutrals with shimmery browns, a dusky pink, and a vibrant burnt-orange. The colours are beautifully subtle without being too much for daytime, even when using the burnt-orange shade. Sleek’s i-D palette is definitely one to be recommended, regardless of whether you’re looking for a Naked Heat dupe or not! Watching Zoella’s Autumn favourites vlog, it was love at first sight when she showed Tanya Burr’s highlighter. Unfortunately, the beauty site I shopped on didn’t have the blush-turned-highlighter shade in stock, so I chose Champagne Sorbet. And, I’m so glad I did. This highlighter is a total essential and at just under £8 (at least on FeelUnique.com), it’s a total bargain – especially if you really appreciate a sweet glow. This lipstick has been out for quite some time and it is so underrated. It’s glossy, yet doesn’t smudge too easily and a great alternative if you’ve found yourself caught in a matte lip rut. It’s hydrating yet not sticky like some glosses. It’s the perfect shade if you want to look polished but not ‘vampy’. It’s also a great alternative to the usual seasonal statement: a bold berry lip. I hope this little guide helps you inject the season into your makeup haul, and that you fall in love with these products if you do try them out. They truly are staples, but like clothes, there’s so much makeup out there – experiment until you find your favourite Autumn products.